The ultimate track helmet is now even better, with an included hydration system featuring internal channels and a drinking valve placed inside the chin area. Improved Aerodynamic performance with MotoGP-developed metal air vents and a wind-tunnel-tested “biplano” spoiler that has multiple wings to maximize aerodynamic performance and add stability at high speed. The 100% carbon fiber shell’s shape is designed to minimize interference with the racing suit, while the interior has an adaptable fit and places no stitching in sensitive areas offering maximum comfort. The Pista GP R offers increased field of vision through the introduction of Race 3 Max Pinlock®, a Class 1 Optic visor with 100% Max Vision Pinlock® (120) and is characterized by a new-patented Visor Lock System (VLS). • Outer shell (outer structure) is made 100% of 3K carbon fibre. Available in 4 exterior sizes to fit the physical constitution of each rider (XS-S), (MS), ML-L), (XL-XXL). The interior has EPS (interior structure) of 5 densities for optimum impact absorption. Its structure is extremely compact and light with unequalled safety features. • The shape of the helmet has been designed to favour the aerodynamic efficiency and to minimise the risk that the energy generated nu an eventual impact is transmitted to the clavicle area. The rear lines minimise interference with the race suit when the rider is coupled with the bike. • The IVS ventilation system consists of five large air inlets and 2 rear exhausts. The ventilation of the upper front part has been strategically placed in order to receive the greatest air flow. • The new metallic ventilations combine strength and protection. Thanks to the entrance of a great air flow and the 2 rear exhausts, the air circulation speed is increased inside the helmet, achieving a good cooling of the interior. The air inlets on the chin bar direct the air flow over the entire screen surface in order to avoid misting. Ventilation plugs are included with the helmet. • The new, wind tunnel tested, rear spoiler affords high aerodynamic efficiency and stabilises the helmet at high speeds. It has been designed to come off in the event of an accident and thus maintain the rounded structure of the outer shell. 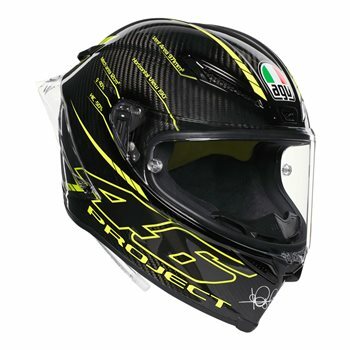 • The interior is fully removable and washable and has been designed by the AGV MotoGP riders. The crown of the neck allows for easy helmet entry and maximised ventilation. Includes foams of different thicknesses for a custom fit in the upper part of the helmet and the cheek pads. • The interior fabric used has an antibacterial treatment and is highly breathable. Seams have been avoided in the more sensitive areas of the head for maximum comfort. • Emergency release system of the side padding in the event of an accident, to facilitate helmet removal by medical personnel. • Hydration system fully integrated into the helmet, developed in MotoGP. The tube has a valve situated in the area of the chin bar for constant and convenient hydration of the rider. The hydration system is fully removable. • The new, class 1 optics, anti-scratch screen has been designed to afford an 85 degree vertical field of view in the racing position and 190 degrees of horizontal vision. An anti-fog Pinlock MaxVision sheet and Tear-Off brackets come as standard. A Tear-Off kit is included with the helmet. • The screen incorporates a patented closure system (VLS) which avoids accidental opening. The thickness of the screen varies between 4 and 5 mm in function of the area, increasing protection of the eyes and face. The screen mechanism allows for tool less extraction and has metallic parts for greater strength. "Roto-translational" system in the mechanism for a perfect fit of the screen to the helmet. • This Helmet is supplied with a Clear Visor as Standard. AGV Visor Ratchet Mechanism - Race 2 Visor /Pista GP/Corsa/GT-Veloce.